How to Recover Deleted PDF Files? Can we recover lost PDF files from Windows systems? Yes, it is very much possible to get back your deleted, unsaved or removed PDF files. There are times when our data files are accidentally deleted or intentionally deleted. The deleted files are moved to Recycle bin, which can be restored easily, but keep in mind that you haven’t deleted the file using “Ctrl + Shift + Delete” command. Below, we have listed a few instances that show the loss of PDF files. Let us go through these cases and look for possible methods to solve such problems. I freaked out the moment I realized that I had deleted some PDF files while cleaning and organizing my computer data. When I searched, I could not find them anywhere. I really wanted to know from the experts, if it is still possible to get back the lost PDF files after deletion. I was working directly on my external hard drive. After a while when I checked for some PDF files, all the data including the PDF files on the hard drive were lost. I really need this data back. Please suggest solutions. When data is deleted from any location on the hard drive, the computer has only removed the reference, or simply the header of the data location and this free space has been marked as free. And any new data can be saved to the same location without any issues. That means, the data still exists on the hard disk of the computer, but it is not readable any longer. So, you can restore or recover the deleted files with some manual methods or with the help of data recovery tool. Note: In case, you are going through PDF loss issue, avoid saving any new file or data into a lost file folder, as it may cause overwriting the lost data. Looking for any deleted file in Recycle bin should your first step, as the deleted files are moved to it. If you find it, right click and press restore option. The file will go to the location where you initially saved it. Step 1: Select Recycle Bin, right click on it and select “Properties”. Step 2: Select “Custom Size” from the dialog box and specify the size (in MB). Step 3: Uncheck the “Don’t move files to Recycle Bin, Removed files immediately when deleted.” Doing this will not delete the data permanently. Users often look for data backup after they face system crash or other related issues. Taking a backup of your computer time to time is an efficient way to save a copy of your crucial data safely on the storage drive. This will simply give you access to your important data when any data loss takes place. Windows OS provides inbuilt features for data backup and restore. After restoring from the backup, you can move the data to any desired location. 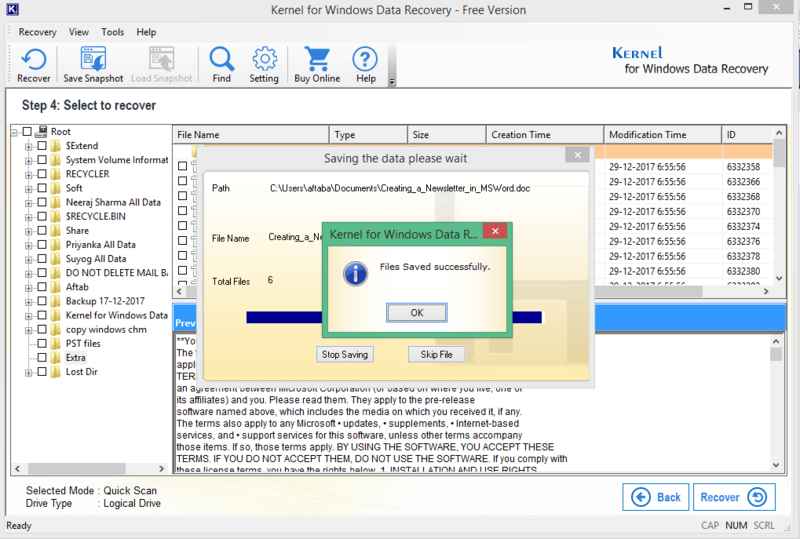 Just in case, if the above methods fail to help in recovering the deleted PDF files, it is highly recommended to use Kernel for Windows Data Recovery Free version. The utility is freely available for all types of Windows data recovery. It can recover all deleted and lost files and folders, media files, emails, and much more. With the free version, you can recover 2 GB of data efficiently. 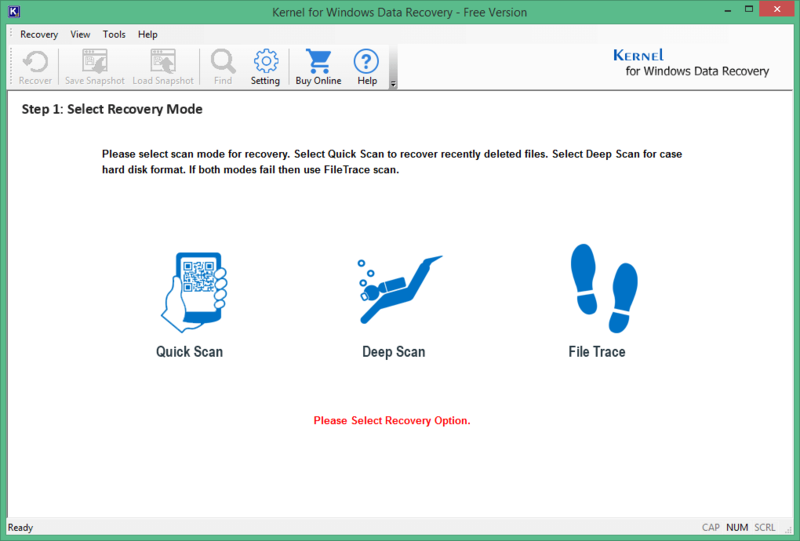 STEP 1: Download and install the Kernel for Windows Data Recovery Free Version and launch it on your system. Now select scanning options according to your requirement. There are three scanning modes offered by the software, first one is the Quick Scan mode which recovers less corrupt files quickly and easily. The second one is the Deep Scan mode which is used in cases where the Quick Scan mode fails to perform. And, lastly, the File Trace mode can be used for highly corrupted files and in cases where the Deep Scan mode fails. STEP 2: In the next step, when you have selected the drive for scanning, you can Preview the selected file content before restoring them on to your machine. STEP 3: At the end, click on the Recover button and get back your lost Windows files safely. 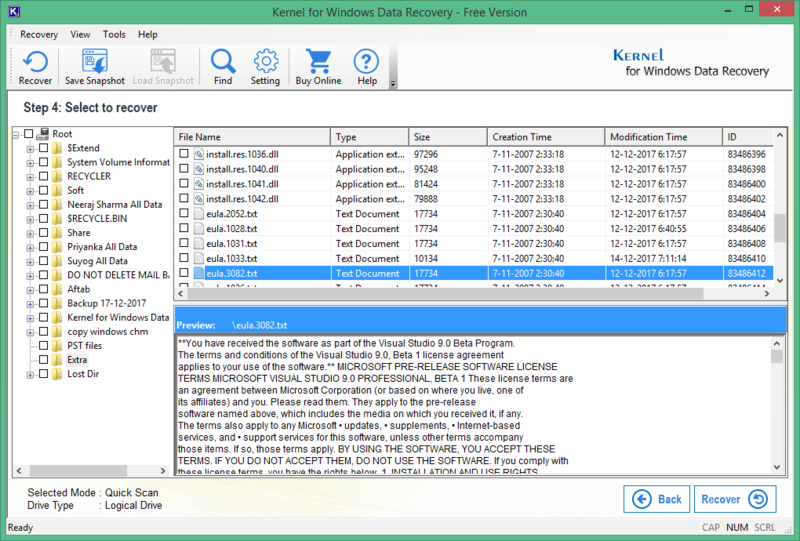 The Kernel for Windows Data Recovery Free Version helps you recover lost and deleted Windows files such as PDF, PPT, DOC, RTF and many more. The free data recovery software comes with a very user-friendly graphical interface and it is the best solution for non-technical users to recover their lost data files easily.